Never clean up the Cell disk-space: Pivotal does not recommend selecting this option for production environments. Routinely clean up the Cell disk-space: This option makes the cell schedule a disk cleanup whenever a container is created. Running the disk cleanup process this frequently can result in a negative impact on the cell performance. Clean up disk-space once usage fills disk: This option makes the cell schedule the disk cleanup process only when disk usage encroaches on the space reserved for other jobs. To select the best option for disk cleanup, you must consider the workload that the Diego cells run. For PCF installations that primarily run buildpack-based apps, Pivotal recommends selecting the Routinely clean up Cell disk-space option. The Routinely clean up Cell disk-space option ensures that when a new stack becomes available on a cell, the old stack is dropped immediately from the cache. 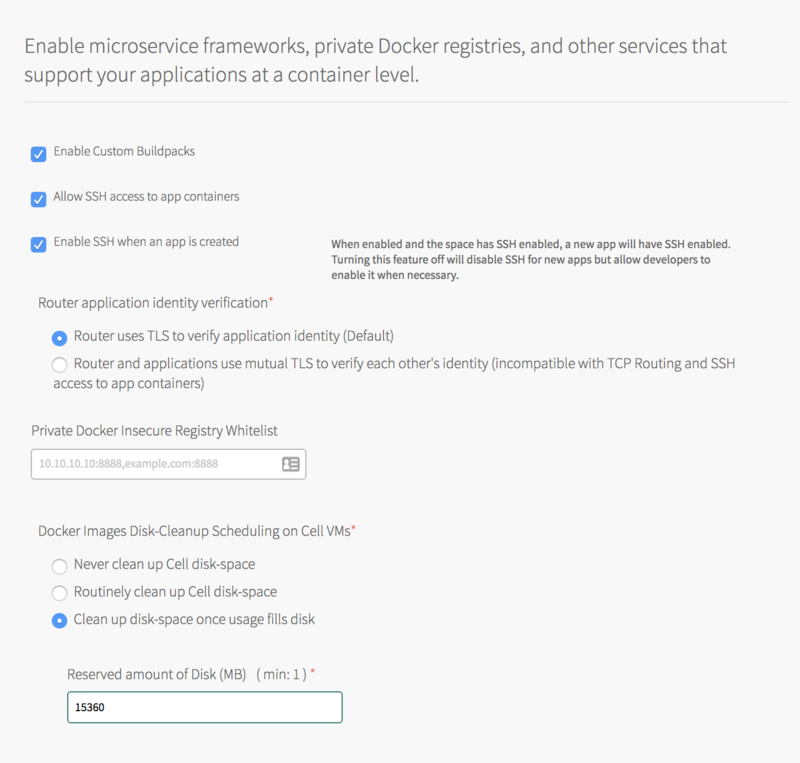 For PCF installations that primarily run Docker images, or both Docker images and buildpack-based apps, Pivotal recommends selecting the Clean up disk-space once usage fills disk option. By default, the space reserved for other jobs is set to a reasonable value for the majority of PCF deployments. The reserve default value accounts for the most typical deployment case where the only other component that writes to /var/vcap/data is the Diego executor cache. However, if you are deploying any BOSH add-ons that require space in the ephemeral disk, you may need to increase the reserve. For more information on disk usage and garbage collection in GrootFS, see GrootFS Disk Usage and Examining GrootFS Disk Usage. Warning: Setting the reserve to an excessive value can cause garbage collection to occur more frequently. An increase in frequency can result in regular slowdowns in performance of apps on particular Diego Cells. Pivotal recommends leaving the default value for the reserve unless you are advised to modify it. If you select Clean up disk-space once usage fills disk, you can modify the Reserved amount of Disk (MB) field. Pivotal recommends that you leave the default value of 15360 MB, or 15GB, in Reserved amount of Disk (MB) unless you are instructed to change it. For more information, see Calculating a Reserve.